A bone spur (osteophyte) is a bony growth formed on normal bone. Most people think of something sharp when they think of a “spur,” but a bone spur is just extra bone. It’s usually smooth, but it can cause wear and tear or pain if it presses or rubs on other bones or soft tissues such as ligaments, tendons, or nerves in the body. Some bone spurs form as part of the aging process. As we age, the slippery tissue called cartilage that covers the ends of the bones within joints breaks down and eventually wears away (osteoarthritis). Over time, this leads to pain and swelling and, in some cases, bone spurs forming along the edges of the joint. Traction spurs are bone spurs also form in the feet in response to tight ligaments. Activities such as dancing and running that put stress on the feet, and to pressure from being overweight or from poorly fitting shoes. For example, the long ligament on the bottom of the foot (plantar fascia) can become stressed or tight and pull on the heel, causing the ligament to become inflamed (plantar fasciitis). 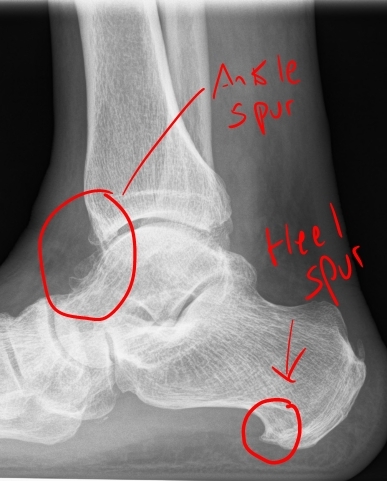 As the bone tries to mend itself, a bone spur can form on the bottom of the heel (known as a “heel spur”). Pressure at the back of the heel from frequently wearing shoes that are too tight can cause a bone spur on the back of the heel. This is sometimes called a “pump bump” because it is often seen in women who wear high heels. Many people have bone spurs without ever knowing it, because most bone spurs cause no symptoms. However, if they are pressing on other bones or tissues or are causing a muscle or tendon to rub, they can break that tissue down over time, causing swelling, pain, and tearing. Bone spurs in the foot can also cause corns and calluses when tissue builds up to provide added padding over the bone spur. 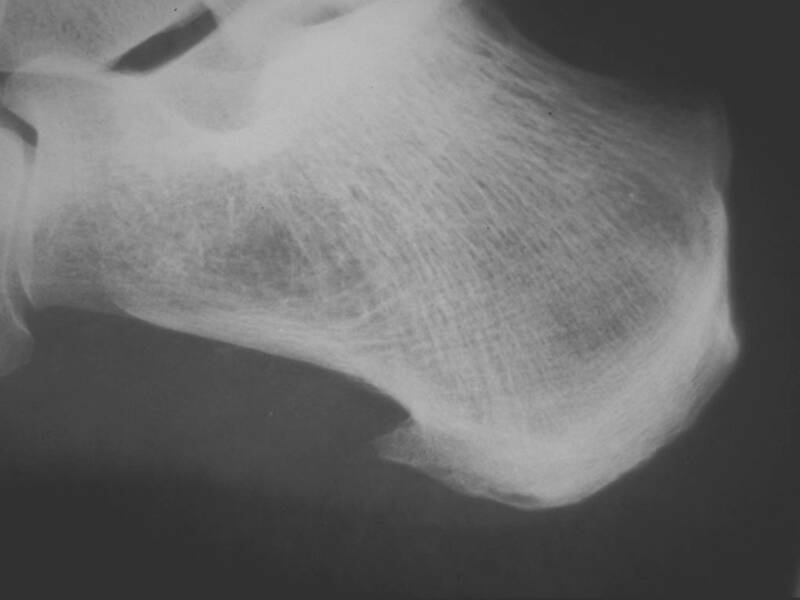 A bone spur is usually visible on an X-ray. However, since most bone spurs do not cause problems, it would be unusual to take an X-ray just to see whether you have a bone spur. 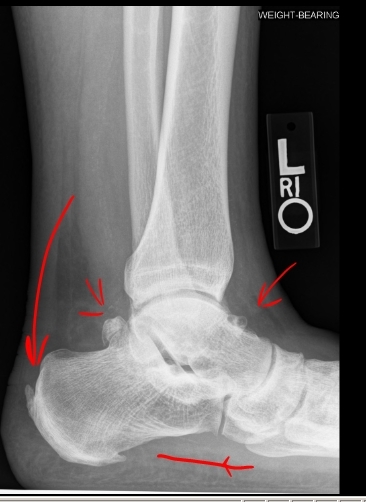 If you had an X-ray to evaluate one of the problems associated with bone spurs, such as arthritis, bone spurs would be visible on that X-ray. Treatment directed at the cause of bone spurs may include weight loss to take some pressure off the joints (especially when osteoarthritis or plantar fasciitis is the cause) and stretching the affected area, such as the heel cord and bottom of the foot. Seeing a physical therapist for ultrasound or deep tissue massage may be helpful for plantar fasciitis . Treatment directed at symptoms could include rest, ice, stretching, and nonsteroidal anti-inflammatory drugs (NSAIDs) such as ibuprofen. Education in how to protect your joints is helpful if you have osteoarthritis. If a bone spur is in your foot, changing footwear or adding padding or a shoe insert such as a heel cup or orthotics may help. If the bone spur is causing corns or calluses, padding the area or wearing different shoes can help. If the bone spur continues to cause symptoms, a corticosteroid injection at the painful area to decrease pain and inflammation of the soft tissues next to the bone spur. Sometimes the bone spurs themselves are treated. Bone spurs can be surgically removed or treated as part of a surgery to repair or replace a joint when osteoarthritis has caused considerable damage and deformity. Examples might include repair of a bunion or heel spur in the foot. Below are patients at the Advanced Foot and Ankle Center of San Diego with a spurs of the heel and ankle. Below is a patient at the Advanced Foot and Ankle Center of San Diego with a spur of the big toe (circled in red).